Montana Power of Attorney Forms is a method where a Montana resident can bestow another individual certain powers to act in his or her place. That is, this template will enable someone to legally confer proxy status onto a trusted individual in certain instances once it has been completed and executed successfully by the person issuing this power. There are many different forms because there are many different circumstances in which this type of document is useful. You may want to prepare a durable POA as part of your estate planning. Or you may want someone to take your place in obtaining a title for your car. It can be broad or specific, depending on your needs. However, in all cases, you need to make sure you know and trust the person you are appointing. All forms should comply with 72-31 Part III of the Montana Code Annotated. You may use This Guide if you should have any questions. 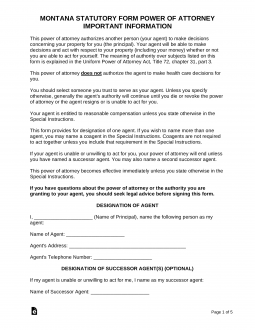 Durable (Statutory) Power of Attorney – A durable form is often used as part of a long-term planning package where a person wants to make sure that his or her finances are in trusted hands if they end up with a health condition that renders them unable to communicate or make decisions on their own behalf. General Power of Attorney – This form is a general form that is similar to the durable, in that you may grant general financial powers to another, EXCEPT that it becomes void if you, as the principal, are adjudged incompetent to make decisions. Limited Power of Attorney – This form is for use in the event you have a limited, specific transaction or time period for which you need someone to stand in your place. Durable Power of Attorney for Health Care – This form is for health purposes. It allows you to appoint a person to represent your medical interests for those occasions where you cannot represent yourself. Guardian of Minor Power of Attorney – This form is for childcare purposes. In the event you need to have someone care for your children while you are unavailable, this gives them powers to make decisions on behalf of your children. Decisions, that you, as a parent, would typically be able to make. Revocation of Power of Attorney – This form is to revoke any previously executed power of attorney. In addition to executing a revocation, it is imperative that you inform your agent and any entities using it that you have revoked it. Real Estate Power of Attorney – For the handling of real property such as closing (sale), purchase, or management on behalf of a landlord. Tax Power of Attorney Form – This form is to allow your tax professional to make filings and obtain information on your behalf from the tax authorities. Vehicle Power of Attorney – This form provides you with the ability to appoint someone to represent your interests with regard to your motor vehicle in front of the Motor Vehicle Division.